Moving over to Canada I have had the chance to try Canadian brands that weren't available back home in the UK. 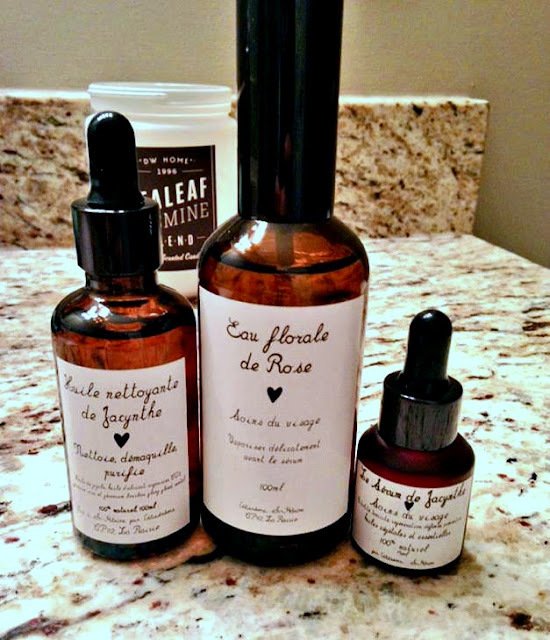 One of the brands that I have been lucky to try is Le Soins de Jacynthe which was founded by Jacynthe Rene in Quebec. Jacynthe is a health and wellness expert with three published books and is the host of a French Canadian wellness show called Vive. * Not tested on animals - the brand recently joined PETA's 'Beauty without Bunnies' program. The products I have been trying are available in the Essential Trio ($124)set: cleansing oil, floral water and Jacynthe's serum. I LOVE the apothecary bottle design that the products come in. The first product I use is the cleansing oil ($27). The oil is composed of jojoba and apricot oil, sea buckthorn CO2, bourbon, geranium rose, ylang-ylang and sandalwood oils. The cleanser can be used as a make-up remover and to help purify the skin and regulate sebum. I apply this to my face and massage it in circular motions, rinsing with lukewarm water and then dry my face. The cleanser really makes my makeup easy to remove and I don't have any left behind. The next step is toning with the floral water ($20). I hadn't used a toning spray before so I was really intrigued about how I would find it! The rose water is anti-inflammatory and helps to tighten the pores and tissue. I love using this mist as it feels so refreshing and the rose scent is lovely. Applying the floral water before the serum helps the skin absorb the serum better. The final step is Jacynthe's serum ($47) which is anti-ageing and helps to promote collagen production and increase skin's hydration. It is recommended to apply it to wet skin, which is perfect after using the rose floral spray. My skin feels so soft after using the serum and one of the things I love most about the product is that it absorbs fast. I love these products and my skin feels so healthy after using them. If you are interested in trying the products you can buy them online or at their boutique: 1955 chemin Fontarabie, La Prarie, QC, J5R 0K3. Are you a big user of natural skin care products? I would love to read your comments! *Disclaimer: Products sent to me but it is 100% my own opinion!